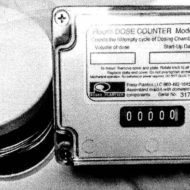 The DC3 Counter is a mechanical tally counter for monitoring the fill/empty cycle of a dosing chamber or similar vessel. It requires no batteries or wiring. It is immune to electrical surges, never forgets, and is housed in a waterproof enclosure. It is activated by a weighted float (3) suspended by a non-corrosive wire. An internal seal allows the wire to activate the counter while keeping out water and contaminates. A dessicant pouch (1) helps to minimize moisture within the enclosure. The Counter mounts on 3″ Sch 40 pipe. Model DC4 is the same as DC3 except the profile of the activator float is changed to operate with a shorter stroke for dosing applications requiring a low drawdown. To get all the details, please click on our product link.